White asparagus is a big thing in Germany (and France and other European countries, if we’re counting). Every year, we are awaiting impatiently the beginning of the season, so much so, that there are progress-reports on the radio detailing the weather & growing situation, the expected quality & crop. It is the Wall Street report on asparagus and it gives you a little insight how much we love those delicate white spears and why we get a little crazy about it, especially after the season ended nearly a year ago (mid-June). If you ask a German, German asparagus is the best, of course. Same rules apply to the growing regions: Spargel from abc is far better than from xyz (I am not using real names, someone might take a contract out, just saying). Growing up in Germany, white asparagus is not only a regional specialty but celebrated everywhere and eaten from a young age on. I can’t imagine anyone who does not like white asparagus with boiled new potatoes, air-dried German ham (our family preferred ham from Northern Germany rather than the smoky Black Forest ham, cut into tiny cubes) and melted butter – or with Sauce Hollandaise on Sundays. Come to Germany in asparagus season and you’ll find this classic dish on the menu everywhere. Being an adult, I am now – like the French – particularly partial to the more intensely & a little bitter violet or blue asparagus, so called because the albino tips have come close to the surface or breached it and blushed into various shades of violet. A perfect example of what Marie-Antoinette’s contemporaries adored: a ‘blushing’ vegetable of an obvious shape, a prime example of an aphrodisiac. 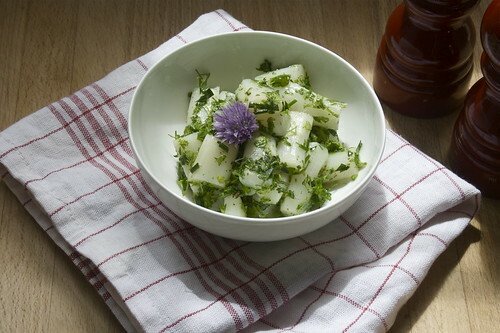 Even if you are crazy about asparagus – white, violet or green – you can’t eat the same dish three times a week, so here is a little light & fresh salad with white asparagus for a change that is a worthy picnic dish or fit for a lunch in a Biergarten (beergarden). Add dark bread, soft Bretzel, cold cuts… or enjoy simply on its own. Peel the asparagus with a vegetable peeler and cut the ends of (a little more generous if the asparagus has been stored a little longer = dry, woodsy ends). Bring water to a boil in a large pot, which can accommodate the asparagus spears (cut in half for a smaller receptacle), add salt & sugar and finally the asparagus. Cook for 8-10 minutes depending on the thickness of the spears; test with the tip of a small kitchen knife. They should be soft & cooked but not too soft or mushy. Take the asparagus out of the water with a pair of tongs, draining them in a colander would damage the delicate tips (the best bit, as my father would say), leave to cool, then cut into 3-4 cm pieces (1½ inches). Make the salad: Finely chop the herbs & mix together with the asparagus as well as vinegar, salt, pepper & oil. Rest the salad for 30 minutes to meld the flavours. Check the seasoning again and tuck in. Spargel kochen: Spargelstangen schälen und die trockenen Enden abschneiden. Wasser in einem ausreichend großen Topf (für einen kleineren Topf den Spargel halbieren) zum Kochen bringen, Salz & Zucker hinzugeben und den Spargel 8-10 Minuten (je nach Dicke der Stangen) kochen. Mit einem kleinen Küchenmesser anpieksen: der Spargel sollte weich und durch sein, jedoch nicht zu weich oder matschig. Mit einer Küchenzange aus dem Wasser nehmen, abgießen würde nur die leckeren Spitzen zerquetschen (das Beste am Spargel, wie mein Vater immer sagte), abkühlen lassen und in 3-4 cm große Stücke schneiden. Den Salat zubereiten: Die Kräuter fein hacken und mit dem Spargel sowie dem Essig, Salz, Pfeffer und Öl vermengen. Voilà. Jetzt noch ca. eine halbe Stunde ruhen lassen, damit sich die einzelnen Geschmäcker verbinden. Nochmals abschmecken. Der Salat ist ganz für sich lecker, mit dunklem Brot oder einem Bretzel, aber auch als Beilage zu Wurst & Käse (Biergarten, Picknick). This entry was posted in appetizer, brunch, food, German, Picnic, quick, spring, supper, vegetable, vegetarian and tagged asparagus, beergarden, Biergarten, herbs, Spargel, white asparagus by thejameskitchen. Bookmark the permalink.